I believe if you are agree that quality of your vlog does not rely on the content only. The quality of the image in the video also takes an important role. That is why a good video camera is essential in vlogging. If you want to be a successful vlogger and plan to become a full-time vlogger, then you must be ready to invest in a quality Youtube camera which is capable of shooting clear and sharp focused videos for your audience. You do not want to buy a video camera that will not get the job done because of shooting poor quality videos which possibly will not help you to increase your subscribers. In this article, we will add some information and guideline to help you find your best camera for YouTube vlogging this year. It’s never an easy task finding the best camera for YouTube videos given the multiple brands available in the market these days. That is why we have put together the top 10 best recommended Youtube cameras for vloggers with their different features, highlighting what each one does best. Then we provide a helpful buyer’s guide. Webcams in most cases have poor performance, especially in low light condition. However, Logitech BRIO stands head and shoulder high because of its extraordinary and stunning picture quality. With maximum video resolution 4096 x 2160 pixels @30fps, this webcam break the myth that you cannot produce a high-quality video in 4K with a webcam for your vlog. As this Logitech Brio comes with clips, makes this webcam needs to be clipped in your monitor or any static place near with your computer due to you have to plug it via USB. First, the drivers will automatically download the moment you plug it into your computer’s USB port to get you started. Sounds great? There are still more good things about Logitech BRIO! If you always want a webcam that gives you control over its field of view, then this is the best option to go for. Through its App, you can choose between 65, 78 or 90 degrees field of views depending on your preference. There are also some fabulous settings that allow you to change to manual adjustment from an automatic balance or whichever way you want it. If you do not want your actual background to appear, there are also settings to let you set the background to whatever you want. Logitech BRIO captures some of the best pictures that a webcam has ever managed. With high 4K resolution at 4096 x 2160 at 30 fps and full HD video. This allows you to choose between shooting high-quality videos with or without 4K mode. It also has facial recognition (Infrared) features which ensure that the camera is always focused on the target’s face every time. It can easily adjust to light levels in any environmental settings and still produce quality images. The brighter the light in your environment the clearer the images captured by this webcam. Forget about other webcams that give you poor images that are always shadowy. Logitech BRIO produces clear images that are balanced. Thanks to its HDR feature. To connect this webcam to your computer, you have to make sure that your computer has USB 3.0 since 4K recording and streaming requires a USB 3.0 port and compatible software. Best for those who like to create youtube channel with live streaming video. The inbuilt microphone gives clear and loud enough sound. This is important because you can use the microphone in different applications. It is not compact since you can only use this camera with your computer or laptop. Like other webcam, it has low light performance issue. If you plan to do vlog in certain location only especially with your computer, e.g. inside your office or your room, then you should consider this Logitech BRIO as your vlogging camera. The connectivity of this web camera with your computer makes this camera the best option for those who like to create a live streaming video on their Youtube channel. The high quality of videos produced by this webcam makes this camera become the best web camera for vlogging. One of the best compact cameras ever made and released to the market by Sony is DSC-RX100. Since 2012 Sony has been working on improving this model, from first series to the latest one DSC-RX100 V which was released in 2016. As everyone knows that Sony is one of the best manufacturers who have been into the videography industry for a long time. Means this brand really knows how to deliver a high quality when recording video. With capability to produce 4K video (3840 x 2160 @ 30fps) and equipped with Zeiss lens makes this camera able to produce good depth of field (dof), excellent color profile which bring you to another level of vlogging. One of the recognizable strengths of this camera is the capability to recording outstanding videos. You can zoom while shooting videos and DSC RX100 still gives you an option of recording under manual focus or AF continuous. It also has excellent image stabilization capability which you can take advantage of while shooting. It gives you two options to use while shooting. You can either use active or standard modes while shooting. Active mode will help you when making large movements while standard mode becomes useful when lightly moving. If the video you are shooting is interlaced you also have an option of capturing still images without interfering with your video quality. It does great in low light, which is really important if you want one camera that accompany you whether it’s noon or midnight. This camera is made from durable and solid material with a compact design and styling. It has twin control dial in terms of design. A dial found on its rear end has two functions, the first being acting as a 4-way controller and the other being controlling the ring that surrounds the lens. Depending on how you set the control to function you can also set it to control your camera’s zoom. The control ring gives you a variety of options to customize your style of shooting videos. Sony introduced their latest display technology known as WhiteMagic and DSC RX100 is the first camera by Sony to have this technology on its LCD display. If you are like other vloggers who find it hard to make sure everything is in focus all the time then you can stop worrying, because that is not an issue with the RX100V. It has super fast auto-focus with 315 points of focus. In a layman’s terms, that means it gets your subject super sharp and keeps it sharp even as you move around. If you want to take your videos one step further and get that cinematic look, you can shoot in S log2 gama mode, which is Sony’s raw video format. It gives you a lot more wiggle room, and creative expression in post production. Meanwhile if you like to include slow motion effect as your secret weapon for your vlog intro, you will be amazed with the high frame rate (HFR) feature, it has 3 settings which can help you to create a super slow mo action with 250fps, 500fps, or 1000fps. This camera is perfect for those who like to focus on their content and let the camera work for them with guarantee of an amazing video. Even it is a relatively small camera this Sony camera can do everything you need for vlogging. It has a lot of features like HFR (High Frame Rate), the 315 points of autofocus and cinematic looks settings are enough to bring your vlogging to the next level like a pro. With the ability to record 4K video this will be your perfect investment if you want to create content that’s going to last into the future. ELECTRONIC VIEW FINDER: retractable Tru-Finder EVF provides sharp resolution, bright self-illumination, and high contrast to view shots and adjust settings through a ZEISS T* coated eyepiece. This legendary Canon G7X has been a perfect option for many vloggers. With its dimension and light weight makes this camera very compact and can serve your vlogging activities almost anywhere. Their Canon G7X Mark II camera is a high-end type of camera ideal for committed and focused Vlogger looking for a camera that will help them deliver nothing but quality. Their Contract Detection and Face Detection autofocus systems are swift. You don’t need to be an expert videographer to start vlogging with this camera, you just need to turn it on, set recording and start vlogging, you will be amazed by how easy it operate while still producing super sharp videos. Another reason that makes we like about this camera is It has incredible 3″ tilt LCD screen that will help you to check if you already setup properly during recording. Just super perfect device to accommodate your vlogging. The fact that this camera lacks 4K recording of videos does not suggest that it can’t be used as YouTube filming camera. It can record top quality videos at 60, 30 and 24 frames per second all at 1080p. A video shot at 1080p by this camera is of good quality just like videos shot by other canon cameras at the same resolution. One of the features that make it easy to shoot professional footage is Dynamic IS. This feature basically functions by bringing electronic 5-axis and lens stabilization together. It’s exposure control is perfect for shooting whether you are shooting at manual mode or automatic mode. This camera captures good quality images and it can record images that do not have noise even at 125-1600 ISO. However, at ISO of 3200, you’ll get to hear some low level of noise. At 6400 ISO the level of noise will definitely be higher but the image will still be good and can be used. Its chromatic aberration handling is pretty okay with a few fringing effects being seen when it’s set at high contrast. Its in-built flash makes it very easy to capture clear images in the dark that have excellent exposure. The first time you touch Canon G7X Mark II you will realize that has a sleek finish and soft. The high quality material used in building it also make it light and compact. The camera only weighs 319 gram with its battery on.The grip is fine and when you hold the camera you will not fear that it’ll drop while using it. With a sturdy finish and a body built from solid material, Canon G7X Mark II comes with well optimized menus. It has a button used as a shutter but it can as well be used for zoom. The lens is surrounded by a ring and this ring can be used to perform different functions including step zoom, manual focus, aspect ratio, ISO and balance. Uploading content to YouTube direct has been simplified by the inbuilt Wi-Fi functionality. As long as you can connect the camera with its App on iOS or Android you’re good to start sharing your videos and photos. The App is easy to use and anyone can navigate through very easily without encountering difficulties. And while within the App you will find several features including image transfer, ISO, remote shooting, zoom, controlling and many more. When you go to Video Mode you can select an Time-lapse movie option, set the interval between shots and the number of shots. This feature is really helpful for any vlogger who wants to records time-lapse sunset or even time-lapse of roads during their travel vlogging. The quality of video is very good. Excellent Image stabilization which ensures that the content is not shaky but the right quality for the audience. This is a decent camera for Youtube if you are a starter or experienced in the world of YouTubing. It comes with great features that enough to support your daily vlogging, from beginner to intermediate level. The fact that it is pretty small and light makes this Canon camera perfect for any condition whether you vlog indoors or outdoors. The only downside is its inability to shoot 4K videos which we don’t think it makes a lot of difference for a Youtube video. When it comes to the best action cam for creating Youtube videos, most vloggers will think a GoPro Hero 5. The reason for this is straightforward. GoPro has taken the market by storm with their amazing cameras that come loaded with excellent features that other cameras lack. It’s never easy finding a mature camera like GoPro Hero 5 considering the outstanding performance and unique features it brings on-board. This camera’s sensor is the same as what is found in its predecessor- Hero 4. What this basically means is that its resolution is 4K at 30fps. With Hero 5 you can still decrease to 1080p at 120fps or 720p at a low of 240fps if you want to produce the most outstanding videos at slow motion. This time GoPro has included RAW functionality or support. This allows you to have a wide variety of options when editing your images or processing them for uploading to YouTube. Hero 5 Black comes with electronic stabilization which functions at 60fps to 1080p. If you go to a higher resolution or fps the mode will get disabled immediately. For most vloggers on YouTube shooting at this resolution is still good enough to end up with high quality of video. Electronic stabilization is a feature any Vlogger would love to have especially when dealing with footage that may be affected if your camera shakes. This camera produces great quality images that are sharp and clear in daylight, but does not performs well in low light condition. Compared to previous cameras by Go Pro, Hero 5 comes with excellent design and build with a power button on its top side. This button also works as its shutter. Turn off button is found on its right and this is the button that will help you navigate through different modes. HDMI and USB ports are on the left of the Hero 5. The front end of Hero 5 has your lens in a finely finished housing. The front end also contains LCD display of the camera and this is the area that you will use to know your camera’s current status such as recording and amount of space left on its SD-Card. The back end of Hero 5 has its 2″ LCD touchscreen. Hero 5’s cover is soft making it susceptible to scratches if you mostly use it when mounted or on different accessories. One of the most appealing features of this camera is the fact that you can comfortably use it even 10m down without having to use its waterproof casing. The amount of noise produced even in low light is minimal. It has excellent exposure capabilities with easy to control chromatic aberration. The sound quality by this camera is far much better than Hero 4. There is a 3.5mm Audio Mic Input that you can use to connect to your external mic. With the ability to reduce the impact of wind, Hero 5 is definitely an easy to recommend camera for a travel vlogger who are looking for a professional camera that has a microphone capable of picking more quality sound when shooting while traveling even in the crowd. There are three Apps you can use on your phone and these are GoPro Studio, Splice and Quik. GoPro Studio and GoPro Quik are the software you can always use if you want to use your desktop computer. Transfer of content from Hero 5 Pro to a device is made possible by the GoPro app. But if you’re planning to spend less time doing transfer of videos to your device you can always rely on GoPro Splice on your desktop. This app will enable you to edit videos, add titles and set tracks. You will get every feature that is found in high quality application used in editing videos. Video trimming is very easy while using this app and you can easily drag your favorite music tracks from your Apple music store. You can always add an additional track which can be your commentary about a video or music track. With these applications, you’re the one to decide how your final video looks like before you share it with your audience on YouTube. Another application you can use to edit your videos is Quik. This is the application that will help you solve complex video editing process and make everything simple. When you want to edit your videos, Quik pulls your videos to the device automatically processing it for sharing on your social media platform. If you have Amazon Echo or Google Home then you should understand how its feels when you are able to command the device with your voice. It is very cool right? This GoPro Hero 5 Black has a voice controls feature, for e.g. to let the camera to stay in the moment you simply say “stay in the moment” while capturing. The voice controls are available in 7 languages at launch, you can tell your Hero5 Black to start recording, take a photo, take a burst, and more. Best for travel vloggers who has unlimited outdoor activities. Touchscreen may sometimes be unresponsive due to unresponsive controls. The software used is not the best and not the quick as it should. If you plan to be a travel vlogger then this is a camera that you should put in your backpack. It is very small, handy, waterproof which will able to serve your vlogging activities no matter of what is the weather condition or the fields you are taking to, this GoPro Hero 5 will always be the perfect mate for you. With the ability to record 4K video, plus it comes with outstanding electronic stabilization. It’s all-rounded and the most advanced camera a serious travel vlogger with high outdoor activities can always count on to shoot great quality videos. If you think GoPro is the only one brand that produce action cameras, then you should take a look at this camera from Xiaomi. Xiaomi YI 4K is a serious contender of GoPro. With cheaper price than GoPro, Xiaomi try to give an option for customers when they look for best action camera. 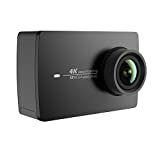 Surprisingly even it cheaper than GoPro Hero 5, it still able to compete in the features and quality in regards as an action cam to support you making your YouTube vlogs. You will be spoiled with the capability of the built-in 12MP SONY sensor that able to record the full 4K video at 30fps. Along with latest technology on the LCD, the lenses and WiFi connection. This camera able to record video with maximum resolution in 4K at 25 or 30 frames per second. Meanwhile for 1080p video you are the one to decide to use either 25, 30, 50, 60, 100 or 120 frames per second. The Sony sensor on this camera and 7 layers of glass in there for the lens which has a 2.8 aperture seems provide a better video recording on this YI 4K camera including when you are recording in a low-light conditions. Meanwhile for slow motion content, this camera captures great quality content with 720p at 240 frames per second which enough for you to create a cool slow-mo effect for your vlogs opening. The camera also comes with electronic stabilization that even not as outstanding when using a gimbal, but pretty helpful for you who has shaky hand issue while vlogging. In terms of appearance, this camera looks almost similar to GoPro cameras. This camera’s front end has LED and lens that shows its status. The screen measures 2.19 inches and it has strong glass protecting it. Something that we take a not regarding the screen is, it is full on touchscreen control which very responsive and intuitive. You even can do playback your video files and scrub through clips right on the camera. Meanwhile on the left side of this camera, there is USB Type-C port which can be used to charge the battery, copy files from the microSD card to your computer. The things that can be a downside, is the fact that there is no port for external microphone. You have to buy extra connector that bridges the USB Type-C with your microphone. If you upgrade the firmware of this camera to version 1.1.24 or up to, then you will able to do live streaming with this camera. All you have to do is first download Yi Action apps on your smartphone, run the application, and on the top right Live menu you have to choose Create Live option, and enter the settings of connection depends on the media platform you want to stream live. And once you setup the connection on your computer, the Yi Action apps will return a QR code that you need to scan with your Yi 4K Camera. Then the wizards will do scanning the WiFi connection and setup the camera with the live configuration. Good quality of video even in a low-light condition. This is a vlog camera for you who prefer camera in action as your vlogging gear but want to spend less than $200 of budget. What surprising is with that price range it comes with great features to help you capture great quality images and videos. You should be able to keep vlogging with this camera after sunset without worrying low quality image in low light situation. Finally, this is a great action cam for vlogging. As long as you don’t plan to use this camera to accompany your surfing, or snorkeling activities, it will be fine, otherwise you have to spend extra money for the waterproof case. Superb Image Quality - Records 4K/30fps (100mbps), 2.7k/60fps, 1080p/120fps, 720p/240fps video, and 12MP raw image with build-in Sony IMX377 image sensor and Ambarella dual-core A9SE75; Equipped with advanced video stabilization (EIS) can capture super smooth footage at 2.7k/60fps. Long Battery Life - High capacity rechargeable lithium-ion battery records up to 120mins of 4K/30fps video with a single charge. High performing cooling system prevents YI 4K Action Camera of overheating and enables stable video recording. Intuitive Touchscreen UI - Built-in 2.2" high responsive LCD touchscreen with 640 X 360 high resolution for easy setting, previewing and shooting. Newly released voice command makes shooting even easier than before. Touchscreen is made with Gorilla Glass Retina to resist scratches and daily impact. Instant Sharing -- Built-in Bluetooth and high speed 5GHz/2.4GHz Wi-Fi support for wireless remote control and the YI Action App for instant photo and video editing, sharing and live streaming to social media. Advanced Features - Always update to the latest firmware (1.8.25) to enjoy the extra features. Flexible settings of ISO/WB/SHUTTER/EV/METER for 12MP raw file help you produce high quality images even in low-light condition; Multi record/capture modes, including burst, slow-motion, timelapse, etc, get more creative and fun. Voice control is available with the latest firmware. 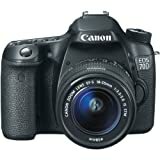 If there is a DSLR camera that popular around Youtubers, that must be Canon EOS 70D. Even famous filmmaker and YouTuber Casey Neistat also used this camera. This camera brings much-advanced features and modes to the world of videography, especially the extraordinary dual-pixel autofocus from canon which able to lock the focus on the object and keep maintain the focus even the object moves or when there is another object moves into the scene. With the combination of the quality of image sensor and the auto focus makes this camera turned out to be a game changer in the world of vlogging. Whether you are an experienced Vlogger or an upcoming independent YouTuber, you will be impressed with the results of this small camera. With 20MP APS-C sensor this camera able to bring you a good quality of video when recording with this DSLR camera. You can record your videos the highest resolution of 1920 x 1080 at 30fps and save in and H.264 formats. If you always worry about the autofocus while recording, you can stop worry with this Canon EOS 70D, because it is the first DSLR that features dual pixel CMOS autofocus system with a breakthrough from Canon in continuous auto-focus technology. With that dual pixel sensor when you are recording with this camera, once you are focused, it will be locked on. Once it gets your face in focus, it’s not going to leave the focus on it. Even if you go out from the frame and then come back in, it will instantly maintain the focus. There will not much focus bumping or moments that are entirely blurry. With the fact that it only has 19 autofocus points which are not a lot, it surprisingly doesn’t affect how this camera maintain the focus. It still able to grab focus immediately. This camera is definitely one of the best DSLR cameras ever released. We know that Canon has always produced amazing cameras and it therefore goes without saying that Canon 70D beats the rest especially when it comes to quality of images, videos and an array of advanced features any serious YouTuber would expect a high-end camera to have. The buttons and handling of this camera are nice for anyone who is planning to take a step ahead of earlier DSLR cameras. Most of the design and features are borrowed from its predecessor Canon 60D despite there being a few changes notable even by a beginner. For instance, there are a few changes on the rear end of the camera as the layout has been revised a little. Info and menu buttons are now found on the rear top left side of the body. If handgrip is always a consideration that you always make before purchasing a camera then the good news is that this camera comes with a substantial and better hand grip compared to its predecessor. Its body is solid as it is constructed from strong resin materials that give it a solid touch and feel every time it’s on your hands. This camera relies on the same 1800mAh, 7.2V lithium-ion battery which is the same type of battery used in EOS 7D and Canon 5D. While shooting with its viewfinder, you can achieve about 1000 clear shots, but when shooting on live view mode this number will slightly drop to 230. It can have interchangeable lenses which will let you to explore more with lenses you want to use for recording a video. The price of this camera nowadays is lowered since there is newer version Canon 80D has been released for a while. This camera is suitable for you who is a beginner in video recording but want to use DSLR camera. This semi-pro DSLR will help you to produce a clear video image quality in 1080p, and you can stop worrying about the autofocus. Since this camera has been released since back years ago, the price now becomes cheaper, which means it will help you to save some cash and you probably want to invest in better lenses that comes up with stabilization and high aperture to turn your vlogs quality to level pro. Panasonic Lumix G7 is a great camera that is mirror-less with an interchangeable lens making it a perfect choice for you who are looking for a camera that able to records 4K with the limited budget. If you are planning to go out there and capture some top quality images for your subscribers on YouTube, thedn you should consider taking a closer look at this fantastic Panasonic Lumix DMC-G7. Its stills are perfect, and it’s the ideal camera for the serious vlogger who is always focused on delivering nothing but the best content for their audience. Fast forward let’s look at some of its core features and find out why it stays ahead of the rest when it comes to recommended cameras for YouTube. Videos captured by this camera are very good in quality, it has a lovely crispy footage quality even when you record in 4K at 30fps. Shooting continuously with autofocus is pretty good, not the fastest one but it still pretty decent. You can use either Contrast Detection and Face Detection autofocus settings for your preference. Different movie options are available all for you to use. You can use the options such as diffraction compensation, filter settings, luminous level, zoom lens noise and general noise cancellation options. The good thing when using this camera is If you use a lens with stabilization, you can shoot while holding the camera on your hands and the image stabilization will help to reduce the shakiness. There are several lightweight mirror-less cameras available in the market today, but Panasonic Lumix G7 stands out of the rest concerning its weight. This camera is lightweight, small and it comes with a solid finish with a firm grip for ease of use. The first look at it you will notice that it is sturdy with a comfortable grip. It has two dials used for adjustment both on the front and the rear end. Inside the dial found on the rear end sits a button used in programming functions. The right side on top has a mode dial which contains automatic, manual and semi-manual and movie modes. Close to the mode dial, you will find the power switch together with a button for movie record. The left shoulder of the camera contains a drive-mode dial which has different options such as self-timer, time-lapse, stop motion, exposure bracketing and several other options you can always use when filming. A photographer who has used previous Panasonic cameras or G7’s predecessor will tell you that the G7 comes with a few changes on the controls. If you are a starter or beginner in the world of photography, you can use its drive mode dial to move or shift from one photo shooting mode to the next. There are several other controls that you can use to customize video shooting the way you want. There are several controls on the external side of the camera making it one of the few cameras available in the market that come with such outstanding ergonomics. It doesn’t perform well in low light condition, you may need extra lighting when shooting in low light condition. With price less than $1,000, this Panasonic Lumix DMC-G7 becomes the best budget camera for the beginner to intermediate vlogger who wants a camera with a capability to shoot video in 4K. With the body lighter and smaller than most of the DSLR cameras, this mirrorless camera from Panasonic can be your favorite camera for vlogging in indoor and outdoor. While the interchangeable lenses still leave some room for you to explore more. Meet the incredible king of all mirrorless digital cameras. The latest full frame camera from Sony represent future-oriented mirrorless cameras that are designed with the final user in mind. This is the one of latest high-end cameras from Sony, beside the beast Sony A9 which and its features perfectly match the price that it comes with. Talk of firm grip, versatile controls, SD card slot, design and latest software all these are entirely included in this camera. Sony A7R Mark III is a professional camera that comes with full-frame image sensors that are designed to make unforgettable photography experience at any time. The camera uses a BSI-CMOS structure whose primary function is to make sure that the camera performs very well in poor light. Regarding the quality of videos and images, this camera able to deliver a quality that something beyond the other cameras mentioned above. With the 42 megapixels, full frame sensor can process a 4K video that will perform well both in the normal light situation or in low light condition. It able to record 4K video in 3840 x 2160 at 30p,25p,24p fps and save in MPEG-4, AVCHD and XAVC S formats. Which means the Sony A7R III able to provide 4K (Ultra-HD) video, highest resolution that you can find in the market today. When you are recording in Super 35mm video mode, there is an increase in image quality in terms of detail and sharpness, this is because the sensor records in 5K video and downsamples the footage to 4K, which at the end produce better quality. This camera comes with a design that almost resembles its other brother known as the Sony A9. What this basically means is that its body has a solid grip and is a bit deeper. The large body means that due to this camera comes with improvements of Viewfinder. The viewfinder in this one is large enough and refreshing. Its diopter can be adjusted from -4 to +3 which requires no use of glasses by some users. This camera’s rear screen supports touch control. The advantage of this is that it can disable the eye sensor automatically and make shooting videos from the hip or any point very easy. Included in the package is a joystick for AF functions. Many YouTubers will find this camera to be versatile mainly because of the inclusion of a joystick. The full frame BSI-CMOS sensor here also means that this camera is able to process more light through the lens, which makes this camera able to perform insanely good in low light condition. Once you have try recording in low light with this camera and switch to another camera, you will miss the quality of video in the darkness especially when you were using high aperture lens. Built in stabilization in the camera body will help you provide less blurry image while recording for vlog. Weather sealed body, which allow you to use this camera even in an extreme weather condition. This is a camera for a professional videographer or vlogger who wants to create their footage to another level. With all the extraordinary features this camera able to answer all the pro videographer needs. If you type of person who doesn’t like to keep upgrades your vlog gears, then this is the best option you can get, with a guarantee it will still be one of the best cameras for creating video footage that can serve you well in several years ahead. In this section, we’ll look at the most obvious things but we will also delve a little bit deeper and look at features that should be considered when looking for a best vlogging camera. We should agree that the most important thing when we are shooting video is to make sure the object in on focus. There is nothing worse than filming a video where they are not quite in focus, things keep popping in and out focus. When recording video you want the main object on focus, that is why you should get a camera with the best auto-focus system. You want a camera that easy to focus on slightly time and able to follow the object. Think about this, when you are recording by yourself, and you have to hold your camera on your gorilla pod, in that situation you will count on the camera to keep the focus on you while you are recording. You don’t want to keep fixing the focus every time. Image stabilization is an aspect that you must consider especially if you are planning to be a lifestyle vlogger who must always have the video camera on the hands while you record. Optical image stabilization is the feature that makes it possible to capture clear images or videos while moving and recording them. It helps reduce the risk of shooting blurred image whether in high or low light conditions. It does this by reducing the shakiness and vibration of your camera while it shoots. No matter your video shooting skills, if your camera doesn’t have image stabilization, then it will hard for you to avoid blurry and shaky video when you are recording while you are mobile. Image stabilization can come from two part of a camera, whether it built-in feature on your camera or on the lens. A camera’s frames per second abbreviated as FPS stands for images that the camera can capture per second. If you are planning to use your camera to shoot activities that are fast, then you will need it to have high FPS. If you are a serious vlogger planning to have some epic slow motion content, then you must be ready to consider buying a camera that has high frames per second. Every time you’re going to record yourself doing something you want to upload on YouTube then you’ll need a camera that has a flip screen. This is always a requirement that every Vlogger should have. You know it’s frustrating when you can’t see yourself while recording so that’s why you must look for a camera that will make you remain in focus and at a right angle as you record. This is a very important aspect to look out for every time you are out there looking for a YouTube camera to buy. If your camera has poor performance in low light, that’s reason enough to get worried especially if you are going to do daily vlogging which include your afternoon activities. Since it can be difficult controlling the amount of light while shooting videos, the only thing that can save the day would be a camera that has outstanding performance even in low light. The cameras that we are going to look at after this are cameras that have been tested and trusted to perform excellently even in low light. If your’ camera’s performance is poor when the light is low, it will end up showing footage noise because of a decrease in its FPS. We are not leaving it there yet because or every problem we are going to find in a camera we must try and find a possible reason or solution for the problem. Let’s find out reasons that can make a digital camera for YouTube to perform extremely poorly when the light is low or dim. A camera will capture more light as long as its sensor is big enough. Normally, the type of camera you go for will determine the size of its sensor. If you go for high end mirror-less and DSLR cameras you will have a big sensor but if you go for camcorders be sure to get small sized sensors. So anytime you’ll be buying a camera just make sure that it has a larger sensor than its close competitor. If you never thought that the size of your camera’s lens aperture does not affect its performance in low light then you have to think again. The wider the aperture of your lens the more light it will capture. NOTE: The wide the aperture (angle lens) the higher the performance in low light. If your camera came to the market after 2014 then this should never be something to worry about because almost all cameras released after 2014 come with Wi-Fi functionality. The importance of buying a camera that has Wi-Fi as a Vlogger is that you will automatically connect it to your phone or device hence making it easy to upload your videos to YouTube directly. Sometimes it’s good to have a teaser for your audience, and that’s why you need to have Wi-Fi to give your audience a clue about what and how the next vlog will be. Wi-Fi enables you to use platforms like Instagram to share a teaser with your audience and give them a teaser for next vlog. As a Vlogger a microphone is something you will need all the time you will be recording something to upload on YouTube. That means you should make sure that your video camera has a microphone. The microphone should be strategically placed so that every time you will be recording yourself it can easily capture your voice. A microphone that is front-facing is always the best. Almost all cameras these days come with a microphone on the front side. If you are not sure whether your camera has a microphone just make sure that you have the right information before you make that purchase order. If you prefer a camera that comes with unique features that suit you as a Vlogger but does not have a microphone, you can always buy a microphone differently and connect it appropriately while recording yourself.